Some 27 million people have thyroid disease, and that number is on the rise. Stress, deficiencies, toxins, autoimmune, soy products, medical radiation, are just some of the percieved causes of this dibilating disease. Experts believe that many more folks are living with the disease while being undiagnosed. Thyroid Balance was designed considering the eastern medical practice that symptoms and sickness are the body’s signal to restore balance, eliminate whatever is causing the blockages, and reestablish the healthy flow of energy. Adaptogenic herbs are plants with properties that exert a normalizing influence, neither over-stimulating nor inhibiting normal body function, but rather exert a balancing effect. They work on a microscopic level by improving the function of cells and making them respond to disease more efficiently. Stress, toxins,and deficiencies are believed to be the major cause of thyroid issues. Adaptogen’s help the body cope more effectively with stress. Adaptogens recharge the adrenal glands, which are the body’s nominal mechanism for responding to stress and emotional changes. 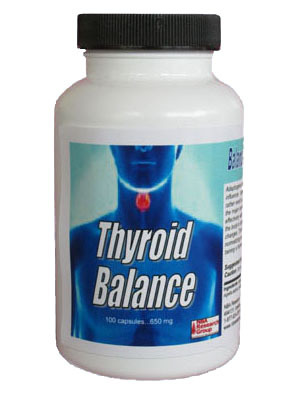 Thyroid Balance is primarily an adaptogenic, influencing a normalizing action, regardless of bias, and may assist the thyroid in maintaining a homeostatic condition. * healthy thyroid function, anti-viral, anti-bacterial, anti-inflammatory properties, boost immune system, prevents allergies and infections, lowers blood pressure, nurtures healthy heart vessels, normalizes cholesterol levels, support bone health, aids in waste movement and digestion. Caution: Do not take if pregnant or nursing, taking blood thinners, or allergic to iodine.